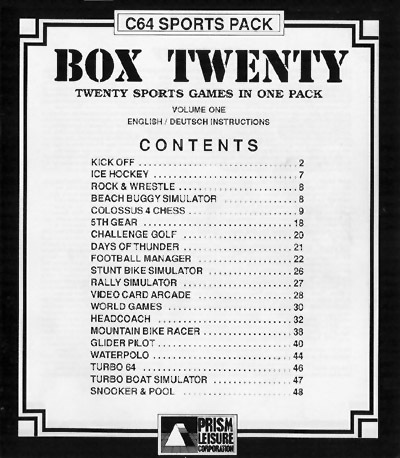 The computer games collection Box Twenty by the company Prism Leisure was released in two volumes. Vol.1 contained 20 sports games and vol. 2 20 science fiction games. 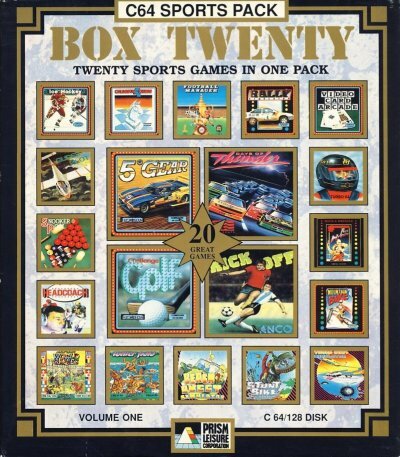 Box Twenty Volume 1 contained 20 sports games on diskette and was sold in Germany exclusively in the department store chain Karstadt for 60 DM. The bilingual manual (English and German) comprises 48 pages. On the cover it reads World Games, Alternative World Games is contained though! Sales price at that time: about ?? DM datasette or ?? DM diskette. This page was last modified on 19 September 2016, at 01:49. This page has been accessed 4,453 times.